I have never been covered in this much mud. It’s soaked into my knees and caked down my legs and on my boots. It’s on my jacket, my shirt, my socks. Inside my clothes. On my face. We spent this rainy day weeding garlic and planting shallots. The latter is a project we started yesterday, and it’s been increasingly messier as the rain starts to fall. Some of the guys yesterday helped Keith with a plastic layer, which sinks thin plastic into the ground that we plant right into and rip up at the end of the year, but I was with the others stabbing holes into the already-laid plastic (and let me tell you, my rows got a little ugly – the first big disappointing mistake of the season) and planting tray after tray of shallots. I never knew the name of anything before now. I bought red onions, sweet onions, onions. Now I look and see Redwings, Conservers, Cortlands, Cipollinis and a slew of other words that weren’t in my vocabulary 24 hours ago. I must have held about two hundred saffron shallot seedlings in my hands today, I hadn’t eaten one for the first time until this past February. Thankfully, we did about seven bands of planting during our brief window of opportunity, and we didn’t do it all completely by hand. 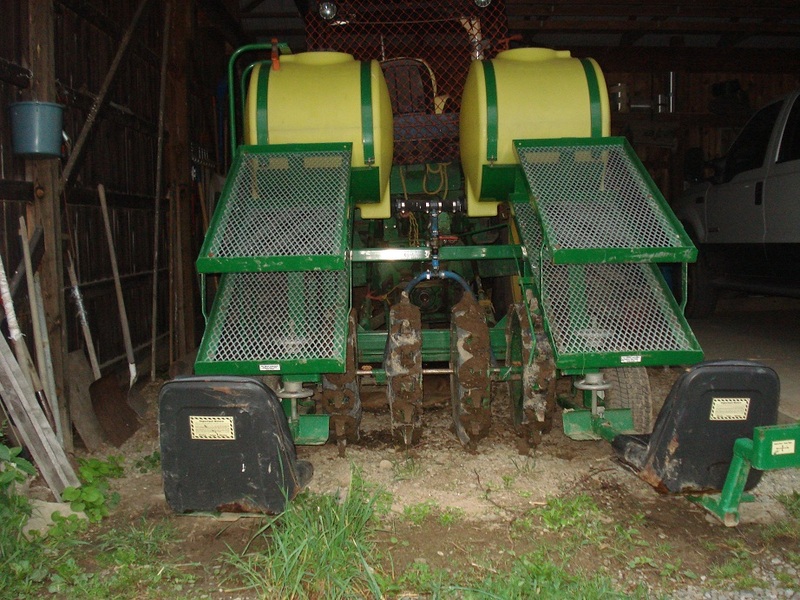 Allow me to introduce you to the Water Wheel Transplanter. Look at how cool this is! I get to ride on the back right because the seat is set for a very short person. Booyah! The water wheel transplanter is an attachment for a bigger tractor that holds 160 gallons of water in these two giant tubes. Right now it’s set up with two seats in the back against the grounds. Above the seats are two racks for trays of plants. There are different wheels that have these spokes, like wedges, and as the tractor moves forward it digs holes into the ground, dumps some water into each hole, and the people in the seats drop the plants. At least with the onions, two people follow behind and cover the hole. Apparently it’s totally boring for the person driving the tractor in creeper gear for band after band, but riding it is pretty neat. Matt and I began to set up poles to trellis our incoming peas. We pulled 8-foot fiberglass poles from the upper barn, a 25-pound sledgehammer and an iron post and headed out to our peas. Some antics ensued as I struggled to be manly with the sledgehammer and as we figured out that the only way to shove these poles into the ground for a few feet was for us to both sort of lean and jump on them simultaneously – which much have looked ridiculous because Keith came riding up on his tractor laughing pretty hard. After some rainy garlic weeding, we headed into the high tunnel to uproot the last of some stubborn lettuce that messing with our ground cover and prepped the ground for Carmens, our Italian frying peppers. Man, I can’t wait. The guys continue to entertain and inform. Matthew and Matt came back to Philly with me this past weekend as ran Broad Street with Back on My Feet, and they seemed to enjoy themselves. We hit up South Street, enjoyed some Yards and, at my friends’ annual Broad Street Brunch, some Philadelphia Brewing Company. Matt taught me how to make crepes, Jay is sitting here playing some throwback Bright Eyes, and Matthew continues to impress and sustain us with his baking. They help me out when I’m not strong enough to move a wheelbarrow or too short to reach the top cabinet in the kitchen. They eat vegetables and grains and buy milk in jars but also have me eating eggs daily and bacon and pizza couple times a week. They have given me free rein to be a little bit gross – like not showering as much as we probably should be. Good thing they’re boys! Today is probably a good day for a tour, right? Check out the photo montage. I wish there was an aerial shot of the property I could show you, but the landscape shots will have to do. The nuns chest, home to clothes of all generations left behind by previous workers. There will be a great post coming up soon about this. Here’s one of the alternate wheels for the water wheel. We can change them depending on what row spacing we need. This is my home! I live here with Matthew and Jay. Here is Jay, freshly showered. After ten days. Long story short, we aren’t showering enough. Check out our fridge – note the six dozen eggs, bowls of bread dough, drawers of organic veggies and cheese, and, of course, Genessee. It’s too hard to take a photo of Keith’s farm. It’s like the Lion King – we farm everything the light touches. Yes, a shout out for the hometown brew, but really? I’m bringing you some better beer when I come to visit. After mud season. That is the probably the most exciting news of the week!